A UI alumna ventures into the Big Woods, endures The Long Winter, and traces the surprisingly enduring appeal of The Little House on the Prairie. I was born in 1867 in a log cabin in Wisconsin and maybe you were, too. 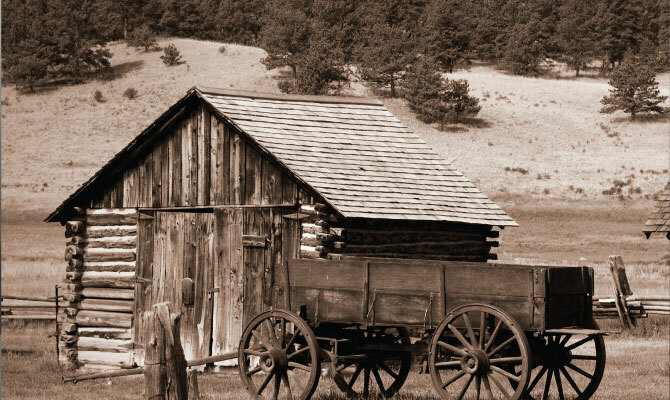 We lived with our family in the Big Woods, and then we all traveled in a covered wagon to Indian Territory, where Pa built us another house, out on high land where the prairie grasses swayed. Right? We remember the strangest things: the way rabbits and wild hens and snakes raced past the cabin to escape a prairie fire, or else how it felt when the head of a needle slipped through a hole in the thimble and stuck us hard, and we wanted to yell, but we didn't. We moved on to Minnesota, then South Dakota. I swear to God it's true: we were a girl named Laura, who lived and grew up and grew old and passed on, and then she became a part of us somehow. She existed fully formed in our heads, her memories swimming around in our brains with our own. Or that's how it felt to me at least. That's how it still feels sometimes, if I really think about it. I mean I don't believe in reincarnation, and obviously Laura Ingalls Wilder didn't either, not with her respectable Protestant singing-off-key-in-wooden-churches upbringing. It's just how reading the Little House books was for me as a kid. They gave me the uncanny sense that I'd experienced everything she had, that I had nearly drowned in the creek, endured the grasshopper plague of 1875, and lived through the Hard Winter. This was despite the fact that I was just one of the millions of kids who discovered Wilder's books in the 1970s and '80s, not too long after the entire nine-book series was released in paperback in 1971, and around the same time the TV show Little House on the Prairie aired on NBC. Girls in earlier eras would have read the books in hardcover editions, perhaps as gifts from nice relatives who themselves loved the books as children. Most of the Little House books I read came from the public library. And, oh my God: I wanted to live in one room with my whole family and have a pathetic corncob doll all my own. I wanted to wear a calico sunbonnet-or rather, I wanted to not wear a calico sunbonnet, the way Laura did, letting it hang down her back by its ties. I wanted to do chores because of those books. Carry water, churn butter, make headcheese. Eventually, I moved on from the Little House books. I'd gotten to an age where the future was more interesting. I went to junior high and high school and college and I mostly forgot the books. I moved to Chicago, became a children's books editor, and wrote and published two books of my own (for grown-ups). When my mother died from ovarian cancer, I began reading the Little House books again. For months, I always had a Little House book in my purse. I could never remember whether or not my cell phone was charged or if I had any quarters for the parking meter, but if I needed to suddenly immerse myself in a passage about making button-strings, I was set. It wasn't just that I was getting old feelings back from reading the books, or that they transported me to some sunny and comforting kind of place. At first the books were just an escape, but after a month or two, Laura World started to spill into other areas of my waking life as I began looking up Laura and the history behind the books on Google and Wikipedia. At some point it wasn't enough to revisit the familiar memory landscape; now I had to know what the twisted hay-sticks the Ingalls family burned during The Long Winter looked like. I had to know exactly where On the Banks of Plum Creek takes place (near Walnut Grove, Minnesota) and that it takes about eight hours and 37 minutes to drive there from my apartment. The accumulation of knowledge began to radiate outward. I found out that Laura's daughter, Rose Wilder lane, helped found the Libertarian Party, and that there was some big lawsuit about book royalties nine years ago, and that the series is really big with homeschoolers, and that you can buy a special Christmas ornament depicting Jack, Laura's brindled bulldog. I even started a secret Twitter account, @HalfPintIngalls, where I pretended to be Laura Ingalls Wilder and wrote posts like: What a day. I curled my bangs with my slate pencil for this? I could see Laura Ingalls Wilder everywhere. I knew there were poems about her and picture books; I found out there were festivals, pageants, plays, websites, weblogs, authorized spin-off series books, unauthorized spin-off series books, dresses, cookbooks, newsletters, fan fiction, albums, homeschool curriculums, aprons, craft items, figurines, dollhouses. Also, a guy in Minnesota believes she is God. No, really, he was running for mayor of Minneapolis and he has this whole religion called "Lauraism" and he wholeheartedly believes she has appeared to him in visions and that she created the world. Over two dozen biographies and scholarly books about Laura Ingalls Wilder and her family have been published over the last 40 years, for practically every reading level, from picture book to dissertation. I started in on the copiously footnoted 300-page biographies and critical books published by university presses. And then a copy of The Little House Cookbook: Frontier Foods from Laura Ingalls Wilder's Classic Stories arrived mysteriously, a surprise from my friend Jen in Utah. I actually shrieked a little as I flipped through the pages. Making the improvised bread the Ingalls family ate every day for months in The Long Winter suddenly became important. Deeply important. I had an antique coffee grinder now, and a jar full of seed wheat that I could grind into a primitive flour. Now all I needed to make an authentic loaf of Long Winter bread was "the dish of souring"-sourdough bread starter. "If you want to make a starter exactly as Laura did, without such helps as sugar, yeast, or milk," author Barbara Walker in The Little House Cookbook warned, "you may have to try several times." And try I did over the course of three weeks, making half-a-dozen batches of flour-and-water batter, which I'd leave in a jar somewhere around the apartment in hopes that the Fermentation Fairy would visit and turn it into bread-making mojo. The jar would start out looking like milk gone bad, and after a day or two it would smell like it, too, always failing to rise or bubble. I went through most of a five-pound bag of King Arthur flour with my failed attempts. The batter needed to be near heat for fermentation to work (Ma kept her batter under the stove). I tried putting it directly beneath a light bulb, near radiators, and in sunny spots, all to no avail. The whole process began to feel superstitious and weird. Why did I have to get rid of half the batter once I'd added more batter to double it? Couldn't it just stay doubled? This thing that I was trying to make happen depended on so many different factors: water quality, temperature, humidity, improper covering, lack of patience. Making sourdough is about capturing something from the air, literally, and I began to imagine that this elusive element wasn't just wild yeast particles but the residue of a lost world. It kept failing to materialize and I was making myself miserable over it. My partner, Chris, noticed the jar on the windowsill one day. I'd left it near one of our radiators, which in the wintertime clanked and hissed and blasted heat, since the boiler in our building wildly overcompensates during the deep winter months. It was an ideal temperature for growing sourdough, except for the fact that it tended to turn the top layer of batter into plaster. "Are you supposed to just let the stuff dry out like that?" Chris asked. I thought for a minute. "I don't know what I'm supposed to do," I said. "But I'm going to try something." I went to the closet and got out our portable humidifier, which I filled with water and placed next to the radiator. Then I set out a new jar of batter. The next day when we got home from work the apartment smelled like bread, and the jar was filled with something that looked like alien spit. Beautiful alien spit. I held up the jar. "Let's get grinding," I said. Chris and I took turns grinding a whole pound of wheat that night on the couch in front of the TV. "I feel like I'm sharpening a great big endless pencil," Chris said. "The dull, relentless pencil of winter." "The Ingalls did this every day," I pointed out. "And without French and Saunders to watch." When at last we'd produced a bowl of coarse, brown flour, I mixed it with the sourdough starter, salt, and baking soda and kneaded the resulting dough. It made a round little loaf the size of a small hat, and it barely rose in the pan. Almost as soon as it had come out of the oven we had to try it. The bread was steaming as I cut two wedges. It was coarse and a little crumbly like soda bread. I blew on my wedge to cool it and then put it in my mouth, this tiny bit of time travel. In The Long Winter, Laura notes that the bread had "a fresh, nutty flavor that almost seemed to take the place of butter." The bread we'd made did not taste like it needed butter, either, at least not while it was warm and soft. It was good enough that Chris said he'd eat it even if he wasn't starving, but not so good that we'd be tempted to finish the loaf, even as small as it was. Somehow, it didn't seem right to eat the whole thing and it didn't seem right to waste it. And then, by the next day, it didn't seem right to keep it. I took it to work and left it in the break room with a little note that said Long Winter Bread, for those who knew the story.